Saturday's weather in Geneva could hardly have been better. Mild temperature, light breeze and high overcast made for great shooting. Some great scores. Brent's Hornet knocked down 31 in Field Pistol (offhand), and Pat B knocked off 31 1/5 scale targets at 200 meters. Great shooting. 12 regulars, one new shooter plus a few spectators enjoyed home made chicken salad and coffee cake for lunch. Clouds and rain didn't keep the crew away from Chuluota today. 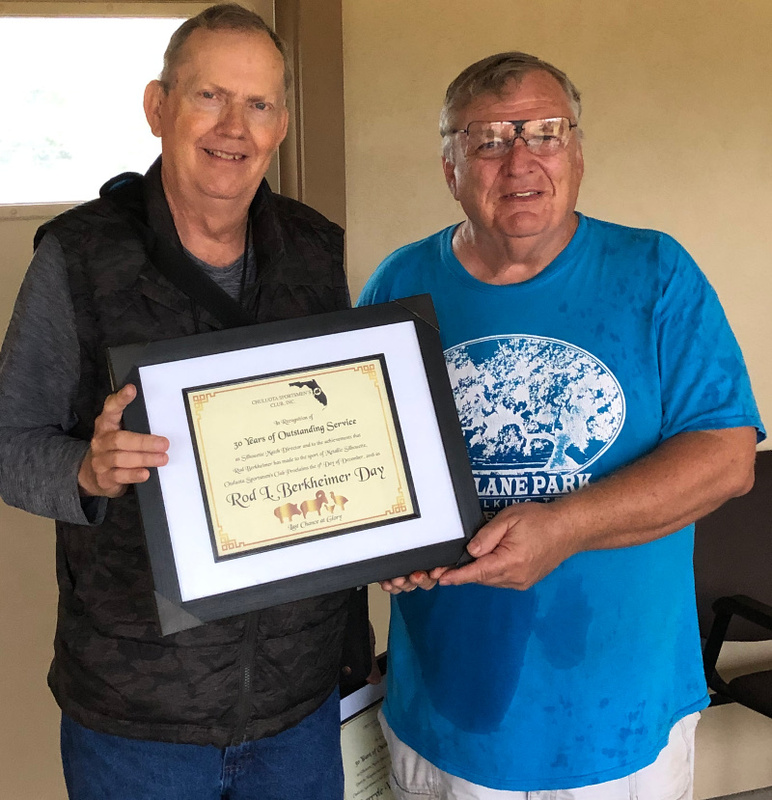 Nice turnout to honor Rod and Darrlye for their years of dedication to metallic silhouette shooting here in Florida. Both received proclamations from the club and a day of their own for untold hours and days of perseverance. The 2018 Sunshine State Games are upon us! Below is the current schedule of events. All FSSA members are invited and encouraged to participate. Join us for a day of learning firearm safety and shooting everyone will have an opportunity to shoot a variety of firearms. Ladies will be divided into groups with experienced instructors. Eligibility: This Tournament is open to all shooters and new shooters are welcomed. However, The State Champion must be a Florida State resident and current Florida Sport Shooting Association (FSSA) member. Refer to NRA Precision Pistol rules for further guidance. Gateway Rifle and Pistol Club (GRPC) hosted its third NRA Women On Target pistol clinic on June 2nd. We had 15 ladies attend, all of whom had little or no firearms experience. 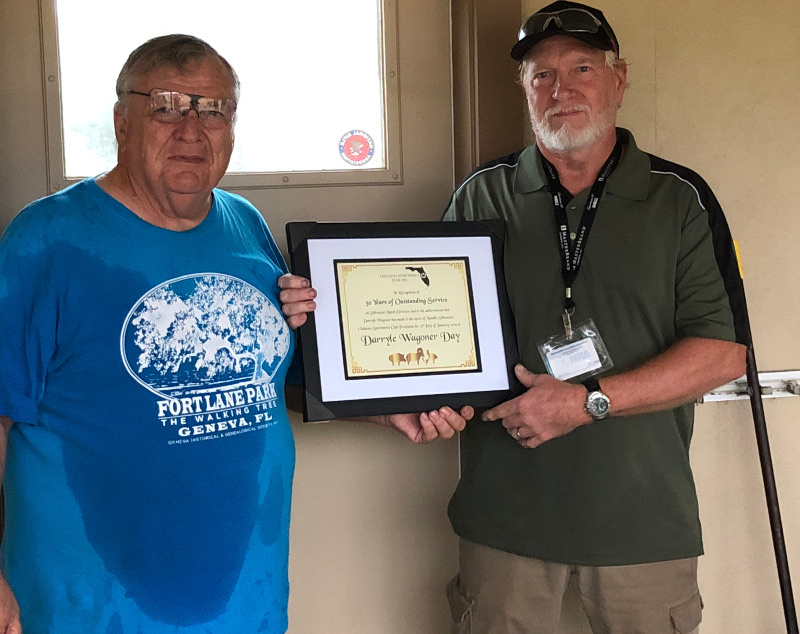 Sue Carter was the Clinic Director, Ted Carter was the Range Safety Officer, and Larry Watkins served as the Chief Range Officer. The ladies spent the first half hour discussing firearms safety and range commands, then another half hour learning the fundamentals of a good shot. They were split into two groups and took turns on the firing line on Range 1 at 15 yards. Each group spent 30 minutes learning to group their shots. They then came back to the line and had 15 minutes to shoot and pop balloons. We'll have both IHMSA (at Geneva) and NRA (at Chuluota) silhouette matches this month. Lots of information, so here goes. We'll shoot IHMSA on Saturday (5/12). Big day as this will also be a club swap meet. The swap meet will start at 8:00 am and will run until around noon. Food and drinks will be provided by the boy scouts. They do a good job and put out a great burger. Any item, gun related or not, may be bought, sold or traded. We are shooting first relay at 0830 so that everyone can shoot and get out before my sweat level gets too high. This will be the last opportunity for SCGAA members to shoot IHMSA qualifying scores for the 2018 club championship, but you can still enter scores from smallbore, CMP high power and benchrest. Right now, 2 members have completed the 3 scores needed to qualify - so it is wide open - you can win the trophy. We expect extra visitors (and hopefully participants) to the range, so please be considerate of those shooting for championship points. Remember our range safety rules, and do not bring firearms onto the line, cased or uncased, during cold range periods. Open chamber flags are required. Also, this will be the last match before summer break. NOAA calling for mostly sunny, with a high near 88. Light east wind increasing to 5 to 10 mph in the afternoon, prepare to stay hydrated. Non-member entry fee for all SCGAA competition events is $15, call my cell 407-415-1707 for gate entry. Hope's number is 407-415-2112 as a backup. Remember, cell coverage is not so good out there, so keep trying. Early arrivals to help set up are always appreciated. This Sunday (5/13), the Chuluota sportsman's club will be hosting NRA silhouette competition. Yes, Mother’s Day, so bring mom out too. $5 per relay entry. Setup at about 8:00, match starts at 9. We shoot hunter's pistol, small bore rifle, and cowboy rifle. Both iron sights and scopes are permitted, except cowboy rifle is irons only. NRA hunter's pistol starts at 9am and we shoot 2 relays. Early arrivals to help set up are appreciated. Smallbore and cowboy rifle at Chuluota starts about 1130-1200. Please remember that central Florida rifle and pistol club hosts smallbore rifle silhouette on the last Sunday, setup starting at noon. Contact us for more information. Any questions, please email or call.